“Beware of idleness,” St. Isaac the Syrian warns the hermits, for “without it a monk cannot fall into the hands of those who strive to enslave him.” St. Isaac warns hermits not to neglect psalmody nor prayer because in abandoning them, the solitary opens a door to the demons. The judgement of God comes upon us not because we have neglected spiritual discipline, as though God punishes us for legal omissions, failing to accomplish our duty, or incorrect use of our resources; but rather the judgement of God comes upon us through the torment of demons because we ourselves have opened the door to them. The spiritual disciplines help us shut the door; without spiritual disciplines, our wandering mind, roaming lusts, hidden fears, and latent self-importance emerge, prying open the door for the tormenting demons to enter. “It is written,” St. Isaac says, “He who is not subject to the will of God, is subject to his adversary.” Spiritual disciplines are the primary way we subject ourselves to the will of God. For those in the monastic life, and especially for solitaries, those disciplines are all-consuming activities of prayer, reading, and work. But for us in the world, the spiritual disciples relate to our neighbor: love your neighbor, don’t kill, don’t commit adultery, be kind, be content with what you have, be generous to others, don’t judge, weep with those who weep and rejoice with those who rejoice. I imagine some of my readers are wondering: “Are these spiritual disciplines?” Yes. These are par excellence spiritual disciplines. When we struggle to be kind or generous or content, we are struggling to be like Christ, and the door through which tormenting demons enter is pressed firmly shut. Of course what we find out right away when we seriously embark on the spiritual life in the world is that we fail miserably at keeping the spiritual disciplines that Christ and the Apostles commanded. We find out right away that we cannot easily be kind, even when we want to be kind–and then there are the many times we don’t want to be kind! We find out right away that within ourselves, within the resources of our own will and desire, we do not have what it takes to practice the spiritual disciplines. And because we fail to practice the disciplines, the tormenting demons attack us–the door of our mind being left wide open for them. Yet, it is the very suffering caused by the demons, the guilt, the confusion, the anger, the lustful passion, it is this very suffering that drives us to God in prayer. It is our awareness of our great need that turns us to God again and again for help. But how do we pray? Certainly, “Help, God!” is a good start. However, in the same way that one might use home remedies for a minor cold or to mend a scratched knee, yet will go to an expert in medicine for a serious condition; so also in our spiritual life we go to the doctors, the men and women who have spent a lifetime learning prayer. We go to the monastics, and particularly to those monastics (or monastic writings) that have proven over time to be reliable and helpful in producing the fruit of the Holy Spirit in those who have heeded their advice. Remember, the goal is not to pray like a monk while living in the world. The goal is to love our neighbor as Christ while we live in the world. Prayer rules and techniques are the means, the means to transformation so that we will be filled with the Holy Spirit and show forth the love and life of Christ. 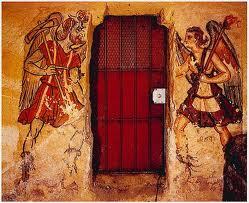 We shut the door to the demons and avoid God’s judgement by actively pursuing the spiritual life. This pursuit requires repentance and our own healing and manifests itself in love of God and neighbor. Prayer is a part of this, an essential part–I might even say an integral part of our pursuit of God and of our shutting the door to the demons that torment us. But he who says the most prayers is not necessarily (and not probably in my experience) the one who is experiencing the most success in the spiritual life in the world. The one who is succeeding in the spiritual life is the one who is learning love the unlovely, who is looking for opportunities to be generous to those who ask, who tries to shut down judgemental thoughts, and who is practicing kindness and mercy even when he or she doesn’t feel like it. Such a one will be heeding the advice of St. Isaac, avoiding spiritual idleness and therefore not becoming the prey of his spiritual adversary.